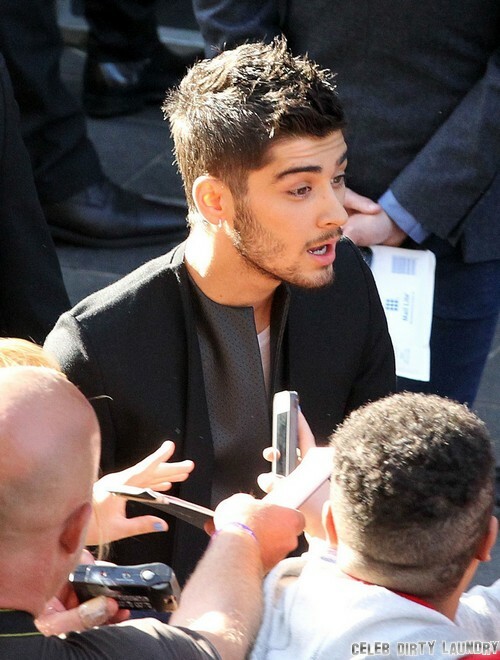 Well, Zayn Malik has become the first One Direction member to get engaged. The news of his engagement to longtime girlfriend Perrie Edwards has been confirmed by several different outlets after Perrie’s mother let it slip in an interview. There were rumors that the couple might be engaged after Perrie was spotted at the This Is Us premiere in London sporting a huge diamond ring, which people correctly assumed to be her engagement ring. Perrie and Zayn have been dating for several years, after having reportedly met backstage at the X-Factor in 2011. Although their relationship has been subjected to a lot of media speculation, including the fact that Zayn reportedly cheated on Perrie a couple of times, it seems like they’ve weathered through the difficult times and come out stronger. While I hope Zayn has the good sense not to cheat on Perrie in the future, at least she seems to have enough faith and trust in him that she said yes. But even then, both of them are incredibly young, and we’ve seen what happens to couples in the music industry when they get married at a young age. They could end up being the exception, but it’s more likely they will become the norm. I mean, they’re both 20 years old and they’re BOTH in the music industry, which will not only make it difficult to coordinate schedules, but it will also mean a largely long-distance relationship. Are they mature enough to make it work? It’s not unheard of, but it is rare. One Direction’s Harry Styles, Zayn Malik, Niall Horan, Liam Payne, Louis Tomlinson: Who is Still a Virgin? One Direction’s Harry Styles, Zayn Malik, Niall Horan, Liam Payne, Louis Tomlinson: Who is the Most Hated and Despised? One Direction’s Harry Styles, Zayn Malik, Niall Horan, Liam Payne, Louis Tomlinson: Who Is The Best Lover? One Direction’s Harry Styles, Zayn Malik, Niall Horan, Liam Payne, Louis Tomlinson: Who is the Sluttiest? Zayn Malik’s Girlfriend, Perrie Edwards, Forgives His Sleeping With Courtney Webb – Gold Digger Alert! One Direction’s Harry Styles, Zayn Malik, Niall Horan: Who Told Perrie Edwards He Loves Her At Little Mix Concert?